Graduate, London School of Economics and Queen’s University; PhD, University of Oxford; executive leadership training, Harvard University. 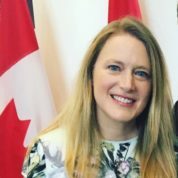 Formerly, executive positions at Industry Canada, the Privy Council Office and the Department of Global Affairs Canada; member of Canada’s negotiating team to the World Trade Organization. Former Vice-President, International and Fiscal Policy, Business Council of Canada (BCC). Was responsible for trade, taxation and fiscal policy and led CEO-level roundtables with India, Japan and China. Currently, General Director, Economic Development and Corporate Finance, Finance Canada. With team of economists, responsible for budget development and advice to Canada’s Minister of Finance. Member: Board, Banff Forum; International Advisory Council, University of Calgary’s School of Public Policy. Served on the Queen’s University Council. Co-Author, No Time for Complacency: A 21st Century Trade Strategy for Canada (2015).